Known for those who need to truly make the most of their time. Our Kent Street location is centrally located in the core of downtown Charlottetown. This charming location is ideal for busy professionals seeking to maintain a healthy lifestyle. Whether you’re dropping in before the office, during your lunch hour or after work, our Kent Street location has everything you need to make the most of your time. We offer a wide variety of fitness classes, including Pilates, and aerobics. This facility features a well-equipped gym floor, large locker and change room, a cardio theatre, a free-weights section, free personal training sessions, and free towel service. Let us help you achieve your fitness goals, regardless of your fitness level. for convenient stand up tanning. home to iMotion and various other classes available. with over 10 pieces of cardio equipment. An interval class with cardio and full body muscle conditioning for all levels of fitness. The class helps build muscle strength and cardio endurance. 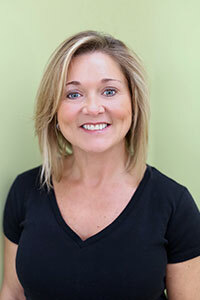 Monique has been a part of the Atlantic Fitness Centre team since it’s inception in 1995. Driven by her personal commitment to health, wellness and customer service, she has been involved in the fitness industry for more than 25 years, first beginning her career in fitness training and personal coaching. With 3-years of prior management experience at a fitness facility in Moncton NB, Monique has managed the Kent Street location for the past 17 years.